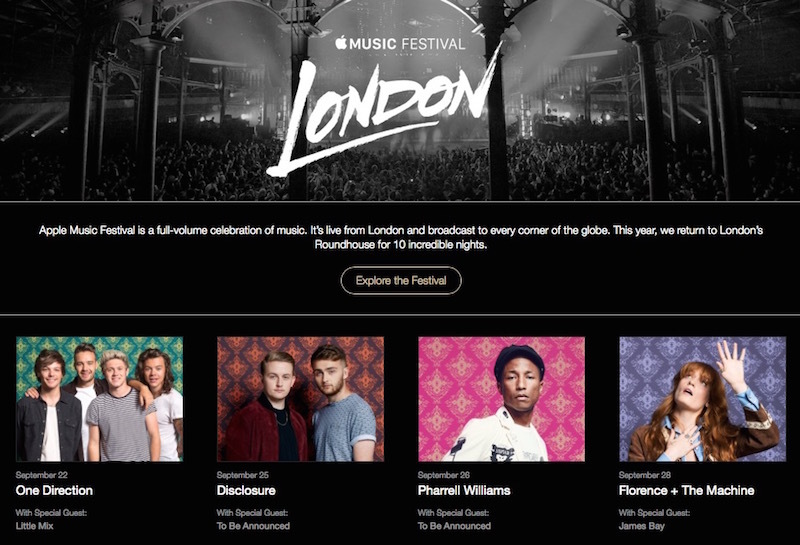 Apple today announced its 2015 Apple Music Festival lineup for next month, a free concert series that will bring Pharrell, One Direction, Florence + The Machine, and more to London's Roundhouse. A revamped version of the previous iTunes Festival, the 2015 version will see a scaled-down lineup with ten dates from September 19–28, down from the usual 30 nights extending throughout the month. Apple will broadcast performances to music fans around the world for free, which can be viewed live and on-demand on Apple Music. The Apple Music Festival lets fans get even closer to their favorite performers with coverage on Beats 1℠ alongside backstage news and footage straight from the artists on Apple Music Connect. With only a handful of artists announced so far, the remainder of the concert schedule will be filled out in the coming weeks. MacRumors has heard Take That will be part of the lineup, but Apple did not include the band in its initial round of announcements. Admission for all concerts is free, but only UK residents can apply to win tickets with additional passes being made available through media partner giveaways. Apple MUSIC Festival - so why is 1 Direction there? Pop music has gotten so bad and lame that it has finally lost my interest. I'm not signed up to an Apple Music membership though. Are Apple restricting ticket applications to Apple Music members? Take that have lost some of its members, One direction has lost some of its members, iTunes Festival has lost more of its credibility. She is never good live. Cannot hold a tune to save her life. Rarely "feels it", apparently. Best enjoyed on recorded media. Not sure what planet you're living on. Florence Welch is amazing live. One direction - that seals is , canceling my subscription to apple music ! Unfortunately this has them covered. Same with Death Metal, Grime, Hymns, Tuvan Throat Singing and other forms of Dirge. I must be getting old: I don't know any of these kids. Never heard of them, never seen their faces and most likely never even heard their music (or whatever it is they do). I'm definitely not the kind of customer that Apple Music is trying to attract. I agree completely. Just for once I would love to see new talents being pushed and supported by the Festival series than pouring yet more fame and money into the cup of mainstream stars. But I might be missing the point of iTunes Festival completely. Maybe it is just that: A mainstream marketing event for the music industry and iTunes. Spot on. It's also that music in general needs to remember harmony. And beauty.